For the second year in a row, Francis Lewis High School in Queens, a huge, successful neighborhood high school that offers a plethora of programs for all students, got more applications from 8th-graders than any other school in the city, according to data released by the Department of Education this week. Nearly 10,000 (9,890) students applied to the school in 2016—listing it somewhere on their list of 12—including those lucky students who live in the zone and are guaranteed a seat. 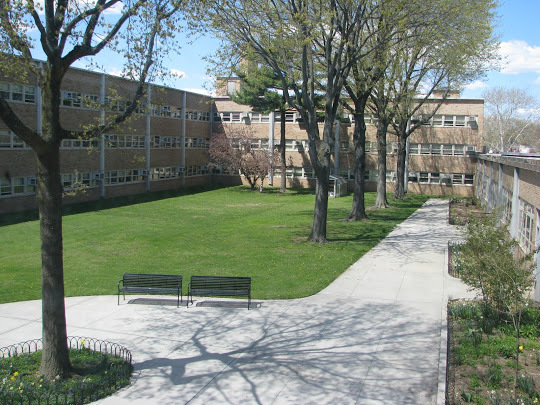 Midwood High School in Brooklyn, with its highly selective medical science and humanities programs, was second, receiving 9,717 applications. Three large neighborhood high schools in Queens—Forest Hills, Bayside and Benjamin N. Cardozo—were third, fourth and fifth on the list of 20 schools receiving the most applications. That's not surprising in a borough where the most popular high schools are over-crowded and operating with multiple start times. Edward R. Murrow, a Brooklyn giant that accepts a wide range of students, was close behind with 6,977 applicants. As in past years, small, highly selective Manhattan schools, received a disproportionate number of applications to available seats: Manhattan/Hunter Science High School received 6,472 applications for only 90 seats. Millennium High School, got 6,398 applications for 160 seats. Eleanor Roosevelt, which gives priority to District 2 students, received 5,760 applications for a scant 104 seats. Beacon High School, with its new building, continues to be popular: 6,202 students ranked it on their application, vying for one of 292 slots. Townsend Harris, an academically competitive school in Queens, also got more than 6,000 applications for its 259 seats. The DOE's top 20 list doesn't indicate how high a student ranked the school on their application, nor does it include the specialized high schools, which students apply to separately. No schools in the Bronx or Staten Island are among the top 20. More than 76,000 8th-graders filled out high school applications for fall 2017.